The few brave and very soaked people who ventured out to hear the excellent Mirror Visions Ensemble at St. John’s Episcopal Church in Jamaica Plain Friday were rewarded by a charming hour-plus, sung and played admirably. Now in its 26th season, MVE concentrates on the relationship between music and text. 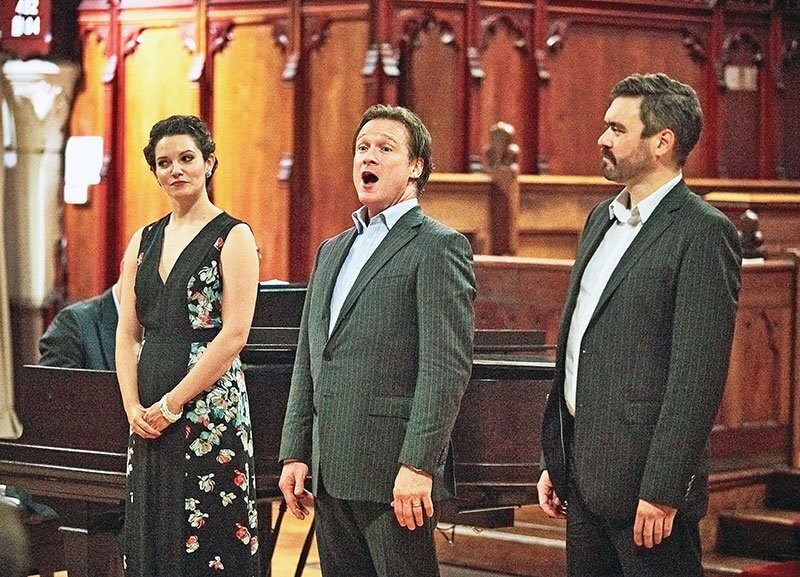 Its core ensemble, three singers and piano, included the distinguished guest artist, soprano Mireille Asselin, in her first appearance with this excellent group comprising tenor Scott Murphree, baritone Mischa Bouvier, and pianist Grant Wenaus. “Invitations to come along” —Henri Duparc’s seductive “L’invitation au voyage,” Joseph Haydn’s “The Mermaid’s Song” and Schubert’s “Willkommen und Abschied (to texts by Charles Baudelaire, Anne Hunter, and Goethe) galloped along quickly and charmingly—the last sung beautifully by Mischa Bouvier. “Berloz’s “L’île inconnue ” and Gilda Lyons’s entertaining “Great Barrier Reef,” commissioned by MVE (texts by Theophile Gautier and Gilda Lyonsalas) journeyed in and under water, before we followed them over land, through valley and forest in Cole Porter’s tongue-in-cheek “Tale of the Oyster,” from Fifty Million Frenchmen sold with off-beat charm by Scott Murphree (text by the ever-clever Porter) and Felice Blangini’s “Per valli, per boschi” by Pietro Metastasio. Mirelle Asselin delivered Debussy’s seductive “La Flûte de Pan” (text by Pierre Louÿs) gorgeously, followed by “Le loup et l’agneau” (The wolf and the lamb) by the often-underrated André Caplet, with burnished baritone Bouvier inhabiting the world of the two animals. The spiritual “At the River,” (text by Robert Lowry) best known in an arrangement by Aaron Copland, here was given in a piano treatment by Charles Ives while tenor Scott Murphree remained steadfastly in Copland’s musical realm. Very Ives-ish. Asselin and Bouvier dispatched another Copland spiritual, “Zion’s Walls,” with generous spirit. Wonderful! “Jordan,” inspired by the words of The Harmonia Sacra, the original shape-note hymnal of the American Mennonite Church (1833), starkly contrasted in mood with the next languid song of Francis Poulenc, “Hôtel,” in which the tenor yearns only to smoke. “Solitary Hotel” by Samuel Barber (words by James Joyce) and another MVE commission, “At the Windermere Hotel” by Tom Cipullo (from a letter by Edna St. Vincent Millay), felt somewhat nightmarish in detailing creepy intrigue in one’s home away from home. Tenor Scott Murphree charmed in Joseph Kosma’s “Deux escargot qui von a l’enterrement” (Two Snails on their way to a Funeral) with words by Jacques Prévert. This was a real discovery; I could imagine Maurice Chevalier half-singing it. Yet another Kosma number, “Le poissonsan souci” (The Fish without a Care, text by Robert Desnos) ended the program. “He has traveled in bottles that tides carried to deserted shores with the Adieu of a ship-wrecked fellow,” sang the three merrily. In between the two, Asselin entranced with Stephen Schwartz’s “Chanson” from his musical The Baker’s Wife. She seemed as if she had been part of this ensemble forever. The chemistry of the group as well as its deft piano playing made for an intriguing and delightful evening.